Of all the museums I’ve visited around the world, the Royal Ontario Museum in Toronto, Canada is without a doubt one of the best. comparable to world-renowned museums like the British Museum or the Smithsonian, the Royal Ontario Museum features millions of items on display ranging from dinosaur fossils to fine works of art. When I visited Toronto last year, I had the opportunity to check out this fantastic museum. Walking into to this beautiful museum, I knew instantly that I was in for a treat. The museum instantly puts their best foot forward by featuring a giant Cretaceous titanosaur Futalognkosaurus dinosaur fossil in the lobby right at the beginning. While far from the only dinosaur fossil at the museum, this giant fossil is clearly the most impressive. One thing that always bothers me about dinosaur fossils at museums is that there are often many parts of the skeleton that are casts and not actual fossils, and it can be next to impossible to tell how much of the fossil is real. However, at the Royal Ontario Museum, each fossil’s information sign includes a small graphic of the specimen that shows exactly which parts are real and which are casts. I really felt like this gave me a much greater appreciation for what I was looking at. I hope that this is something that other museums will replicate in the future. 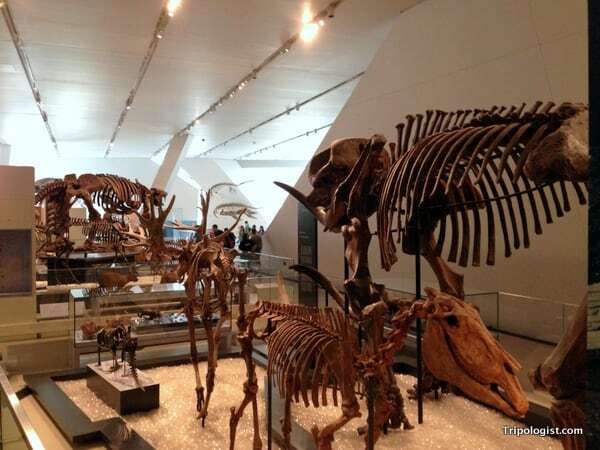 A collection of dinosaur fossils on display at the Royal Ontario Museum. Moving on from the dinosaurs in the lobby, I next headed to the museum’s section of Asian art. Having spent 2.5 years in Asia, I felt a bit like I was back “home” when meandering through the galleries of Korean, Chinese, and Japanese art. It was easily one of the best collections of Asian art that I’ve seen outside of Asia, save for possibly the Philadelphia Museum of Art in the US. However, the museum doesn’t just feature Asian art. In fact, it features art from many other regions of the world, including the Middle East, Africa, Europe, and even the First Peoples of Canada. 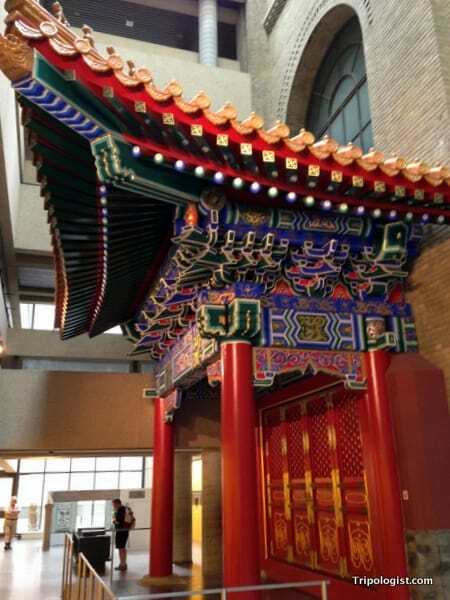 A Korean gate on display at the Royal Ontario Museum. The First Peoples’ area was another that I really found interesting. Living on the US East Coast, I’ve learned about the native tribes of the area, but I haven’t ever learned much about those that resided in Canada. The display at the Royal Ontario Museum offered a great look at these First People and allowed me to really compare and contrast their lives with the Native Americans I had learned about in school. For those less interested in history and art and more interested in animals, the museum also features a large collection of taxidermied animals in semi-natural settings. I personally didn’t find this area quite as interesting (it was like a zoo’s cemetery, in my opinion), but I definitely can appreciate that the section was well done would certainly appeal to some people. Overall, I quite enjoyed the Royal Ontario Museum. 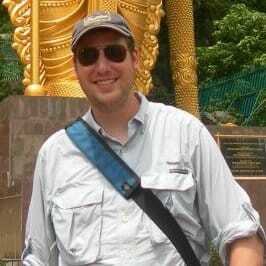 It’s amazing collection and diversity ensures that it will offer several sections to interest anyone. 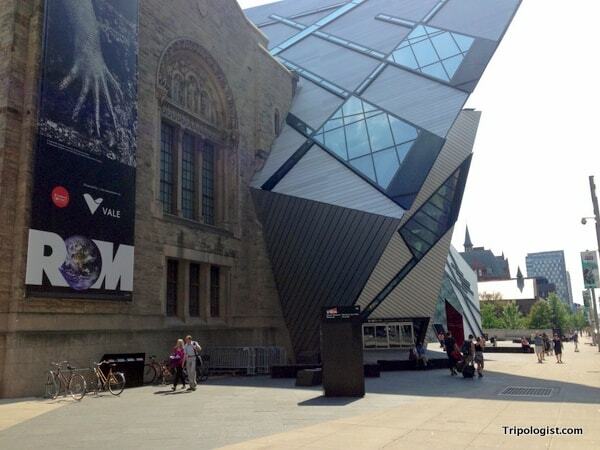 Consider this a must-visit attraction when visiting Toronto, Canada. I missed this one on my trip to Toronto last year. I loved my visit to the Ontario Science Center. Need to add the Royal Ontario to my list for my next trip.